Now to the postcards. 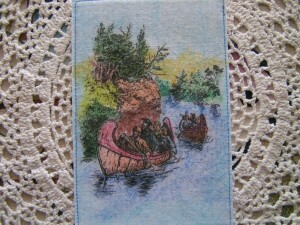 It looks like 2012 is going to be a great year for Trading Fabric Postcards. 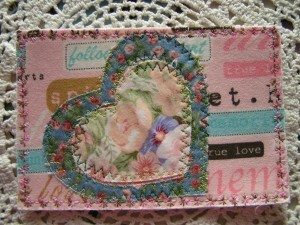 Our group is growing every day and our swaps are doing wonderful. We truly have the best members on the face of the earth! Here are some cards for you to enjoy and if you have any questions about joining or how it works. Just ask. 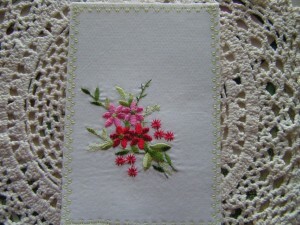 SadieMaesAttic@aol.com is the email address. Put Post Cards in the subject line. 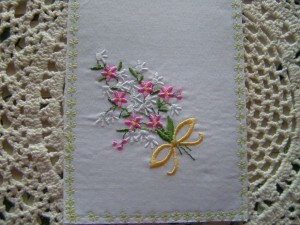 This card was made by Marlene. 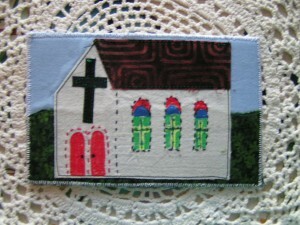 I love the old country church look. We have an alphabet swap going. 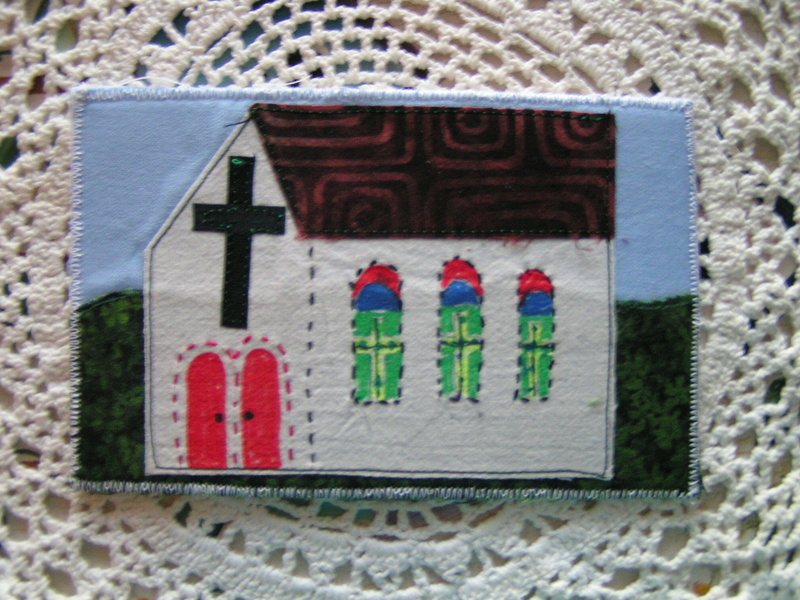 This was C and she chose Church for her card. Thank you and I like the way you used a marker to make the windows look like stained glass. This card “C” caterpillar with a cap on was made by me, Chris. During the summer at my home I see a ton of these , but so far none has had a hat on. 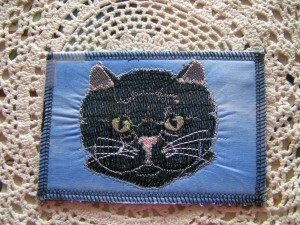 Terri chose her black cat for Friday the 13th Swap. She could have not picked a better card for me. 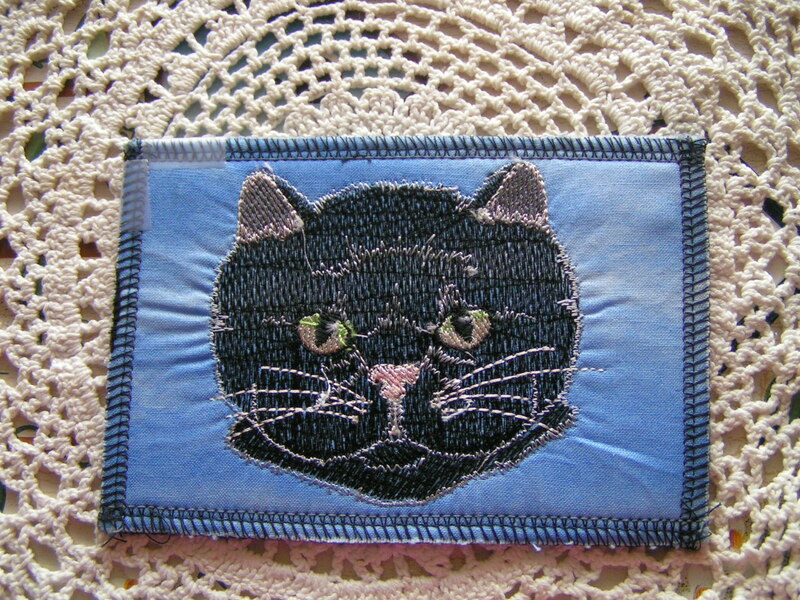 I used to have a black cat Spooky. He lived to be 17 and was a mess. Lived up to him name Spooky.. Afraid of his own shadow! 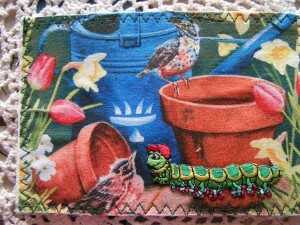 Terri has great embroidery programs on her machine. 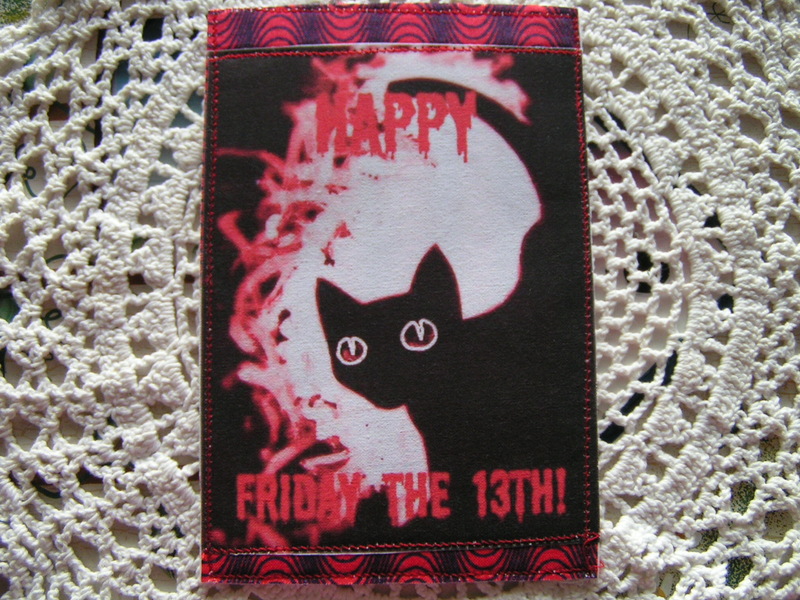 Here is the card I made. I thought and could not come up with what I wanted to do on my own. 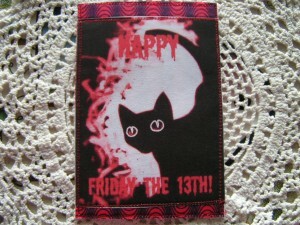 I googled Friday the 13th and found this card. I printed it out on fabric and sewed it to a background. I think it worked out pretty good. Anita made this card. “Maudie” as I call her lovingly! She decided for the Explore swap that she and I need to go down the creek and she was we could find. She is a person after my own heart. She pulled out the box of Crayola Crayons and used them on the card. No one loves “colors” as much as I do. That is what we called them growing up. I just open the box sometimes and smell them. I love to color! This is my Explore card that I made. Do you not wish one day we would look outside and see one of the saucers flying by? I do .. 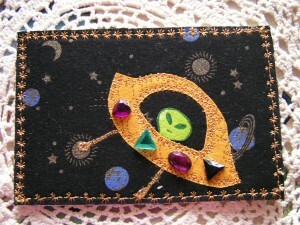 I have always loved reading and studying about Aliens and X-Files was on my list of favorite shows. I really liked making this card. 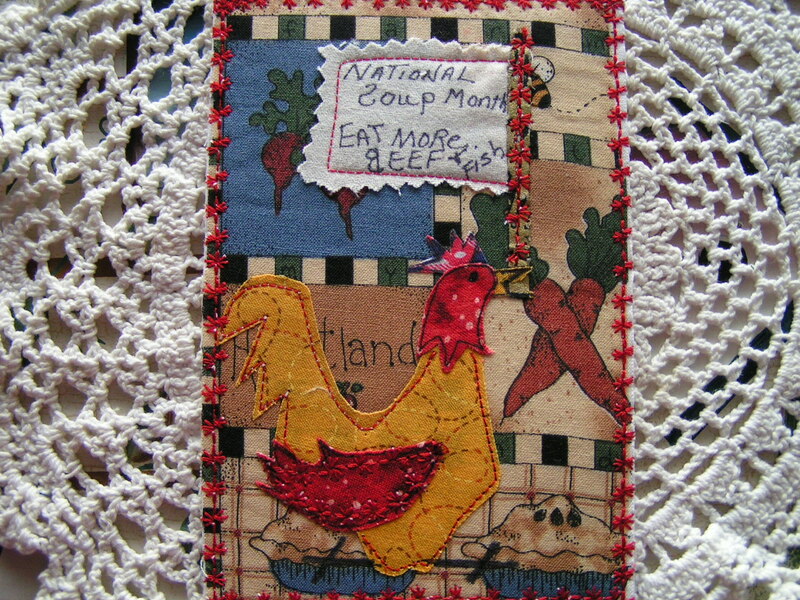 We had a National Soup Month Swap. Carol made me this vegetable soup card. Doesn’t it look delicious? I love veggie soup. 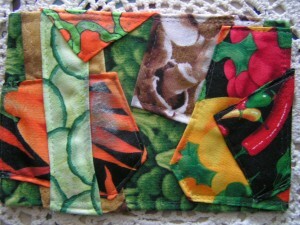 She used a great bunch of fabric . Very colorful. 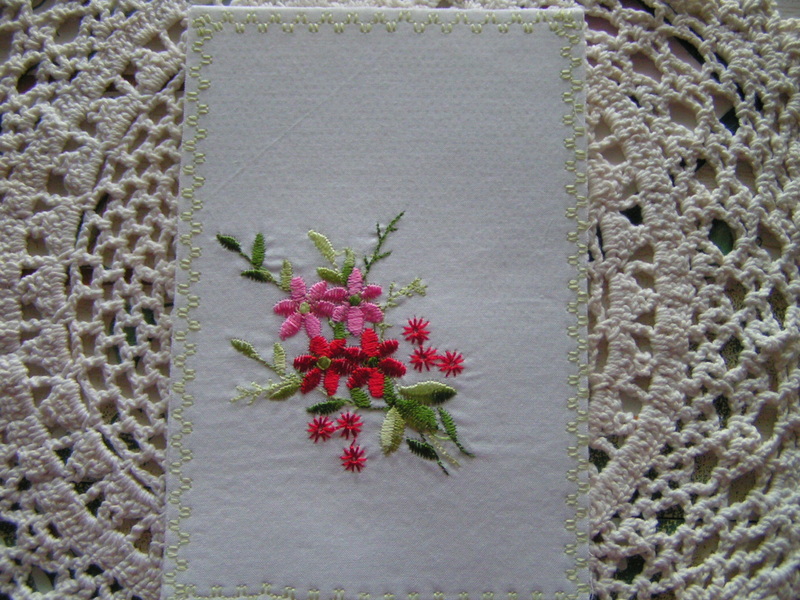 I decided to cut up some old linens I had to make a birthday card. 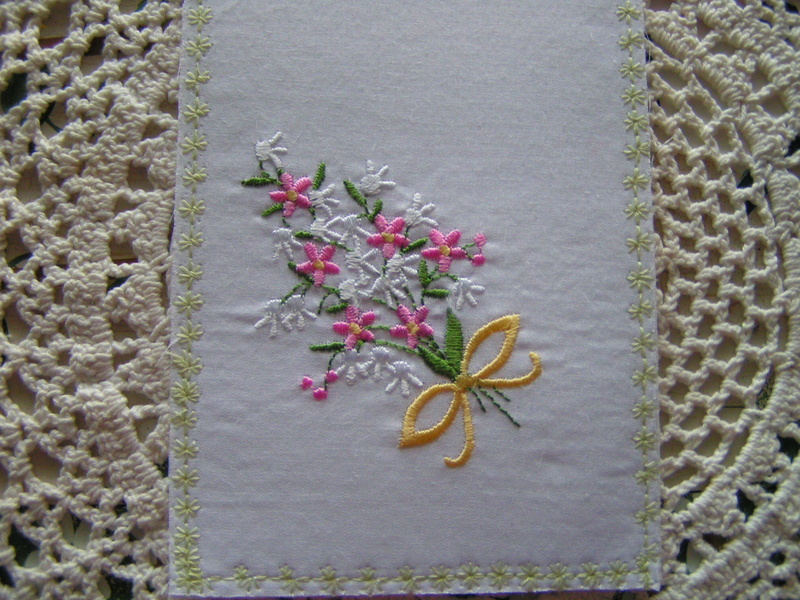 Another card I made out of some old linens. We had an Elvis Presley swap. 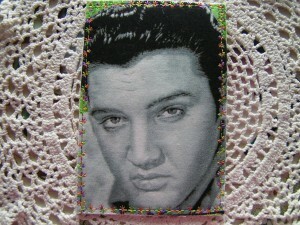 Who does not remember the King of Rock and Roll ? 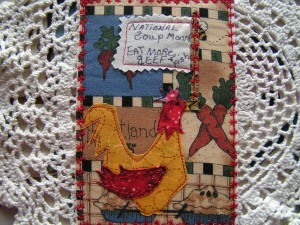 This was the front of the card. 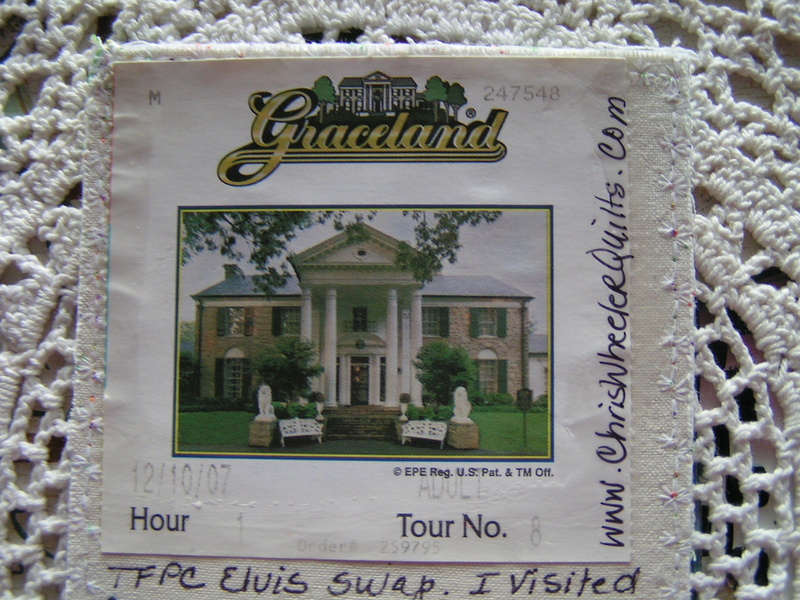 Here is the back of the card with an actual ticket stub that I got when I visited three times in one year. Yes you heard me right. 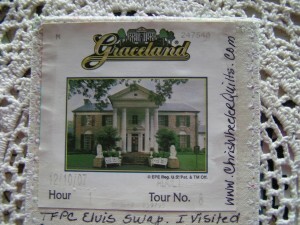 Gary and I went to Graceland in Memphis, TN. Then a friend of mine wanted to go so we took her. Then my Aunt heard about it and she wanted to go and we went again. I really enjoyed this trip. There was only one person in the house with us. It was a few days before Christmas and not much visitors then. It was like we had the entire home to ourselves. If you are ever in the area it is a wonderful place to visit. 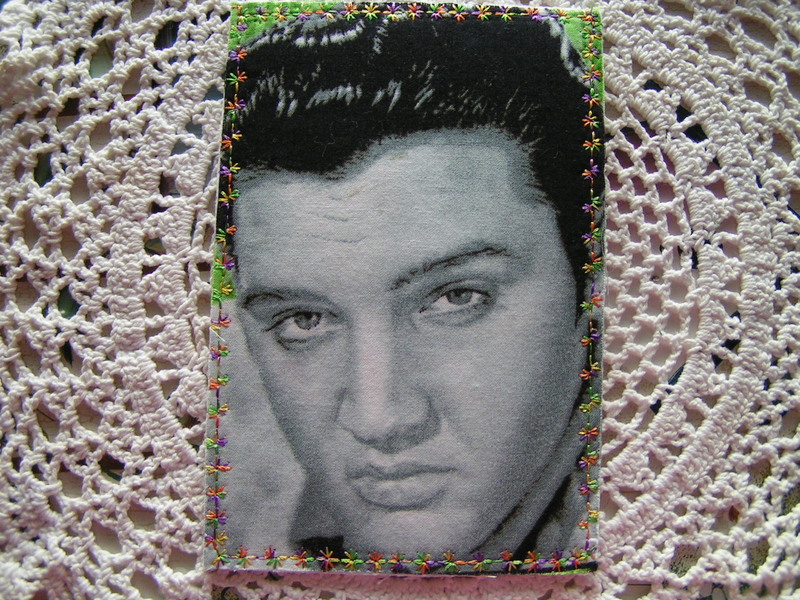 Even if you were not an Elvis fan. It just is interesting. Maybe someday I will go again in December and have the place to myself. One room was covered with fabric on the walls and ceiling. I just wish they would let you go upstairs and tour the bedroom. Can you imagine how many people visit yearly now and IF THEY DID THAT how many folks would come. Millions more to see Elvis bedroom. Last but not least, let me send some LOVE your way. 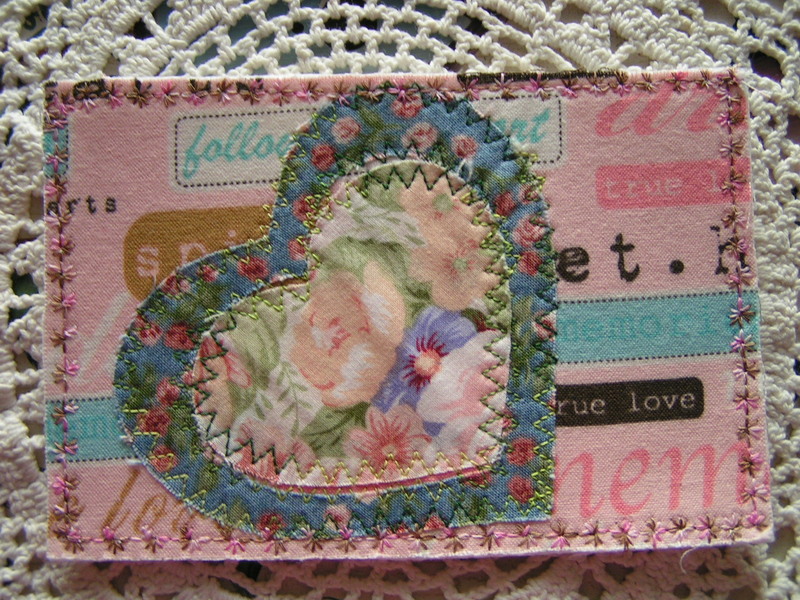 This was the card I made for Valentines Swap. 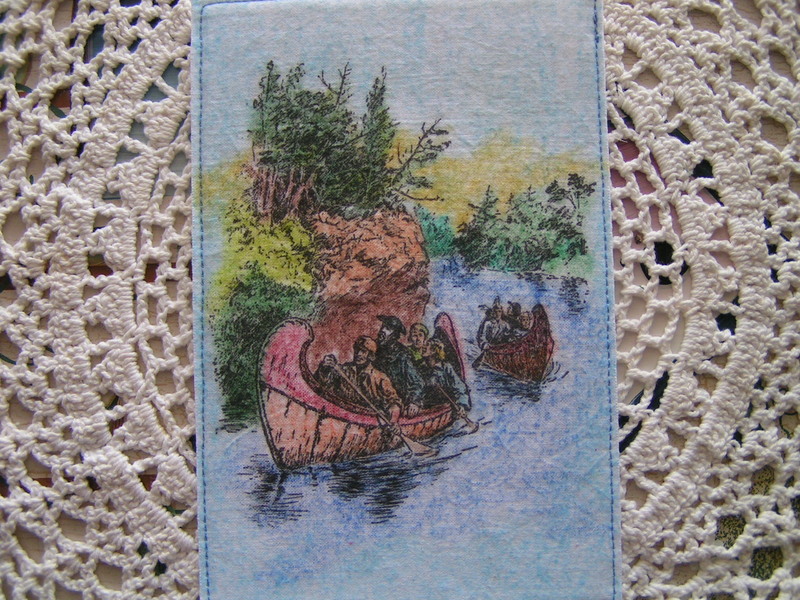 This entry was posted in 2012, Postcards made by Chris, Postcards Received, Uncategorized. Bookmark the permalink. Chris, I love your themes and colourful cards. Well done.